The influx is remaking Japan’s ski resorts — and potentially its foreign policy as well. Japan is experiencing a boom in tourists from China. Official figures show the number of visitor arrivals from China increased four-fold over a five-year period, from 1.4 million in 2012 to 7.4 million in 2017. That means China has overtaken South Korea as the top source of visitors to Japan. Ski resort regions like Niseko, in Japan’s northern Hokkaido prefecture, are witnessing the inflow. “What we are seeing is the greatest emerging market on earth start to mobilize,” said Colin Hackworth, representative director of Nihon Harmony Resorts, which is involved in running the Hanazono Niseko ski resort. In Kutchan – a town near the Niseko ski resorts – Australians still dominate the international tourism market, logging 96,545 overnight stays in 2017, but this figure was slightly down on the previous year. At the same time, the town has recorded strong growth in visitors from Hong Kong, Singapore, Thailand, and the United States. The number of overnight stays by visitors from China, meanwhile, surged to 32,817 in 2017, up 74 percent from the previous year, according to data provided by a Kutchan town official during a recent press briefing. To cater to changing tastes, an upmarket Park Hyatt Hotel is being built at Hanazono. The development, due to be completed by December, is owned and financed by Hong Kong-based Pacific Century Premium Developments, the parent company of Nihon Harmony Resorts. 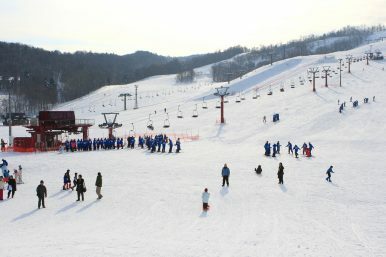 Hanazono’s operators also plan to roll out new “state of the art” ski chairlifts with heated seats and wifi, subject to government approval. Meanwhile, ziplines – pulley and cable rides – are also expected to be built soon to entice thrill seekers. One of these is set to extend for 1,680 meters, which would make it the longest zipline in Asia. “The market’s changing – it is changing tastes and it is changing budgets as well,” Hackworth said. 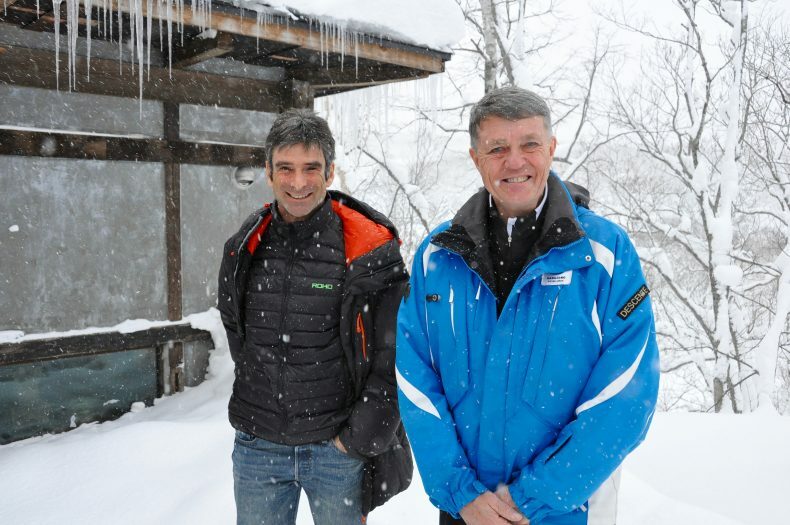 Ross Findlay, left, of Niseko Adventure Center and Colin Hackworth of Nihon Harmony Resorts speak about the increased demand from China. Photo by Daniel Hurst. Operators expect demand to grow further as a result of the Chinese government’s plan to have 300 million winter sport participants by the time Beijing hosts the Winter Olympics in 2022. While China is building its own ski resorts as part of the transformation, many of the country’s emerging skiers and snowboarders prefer to travel abroad. Ross Findlay, managing director of the Niseko Adventure Center, described Asia as “an awakening market” that would account for an increasing number of visitors. “As a ski market it’s something that is just going to get bigger and bigger because more and more people are having the finances to be able to come for a ski holiday and are keen to do it,” Findlay said. The growing importance of Japanese tourism exports to China coincides with Prime Minister Shinzo Abe’s recent efforts to improve relations with Beijing. With the Japanese government setting aggressive targets for further growth in visitor numbers, it seems to make sense for Abe to tread carefully when dealing with other sensitive issues in the bilateral relationship such as concerns about China’s actions in the South and East China seas. Edoardo Saravalle, a former researcher at the Center for a New American Security, has previously characterized tourism as one of China’s under-appreciated foreign policy tools. In an article for The Diplomat last year, he pointed out how China had limited the flow of tourists to Taiwan after the 2016 presidential election and to South Korea to protest the deployment of a U.S. anti-missile system in 2017. In an address to the opening of parliament this year, Abe was upbeat about the bilateral relationship. He suggested that Japan and China would be “deepening mutual exchanges between the people of the two countries, in every field such as politics, the economy, culture, sports and youth exchanges.” The large growth in visitor numbers from China indicates that this trend is already well underway. Disclosure: The author travelled from Tokyo to Hokkaido as part of a Japanese government-organized press tour. Maritime tensions and historical issues notwithstanding, Chinese tourists are flocking to Japan. Why?